M31 G1: Mayall II, brightest Globular Cluster orbiting M31, the Andromeda Galaxy. Globular clusters are groups of roughly spherical, densely packed stars. They are thought to have formed at the same time as most galaxies and the stars which make them up are some of the oldest known–thus GCs are an excellent probe of galaxy formation and evolution. They have a high central stellar density, meaning collisions between stars are actually possible in their cores (in most environments such collisions are so rare as to be deemed impossible). There is no evidence of presence of a black hole in their core and their mass to light ratio is consistent with no or little dark matter content. There are around 200 known GCs in the Milky Way, whereas Virgo A (M87) has over 12,000. The Andromeda Galaxy (M31) is thought to contain 500-1,000s and this past week I read a paper focusing on the GC system of M31 out to a much-higher-than-previously-studied radius of 120 kpc1. 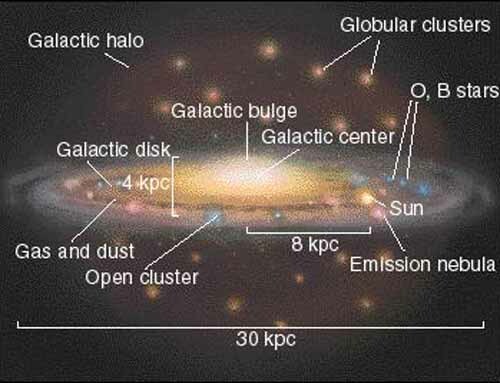 For a sense of scale see the image of the Milky Way to the right, which is about 30 kpc wide, 4 kpc tall (excluding the more extended Galactic halo), and we are 8 kpc from the center. Andromeda is thought to be 20-31 kpc in size. 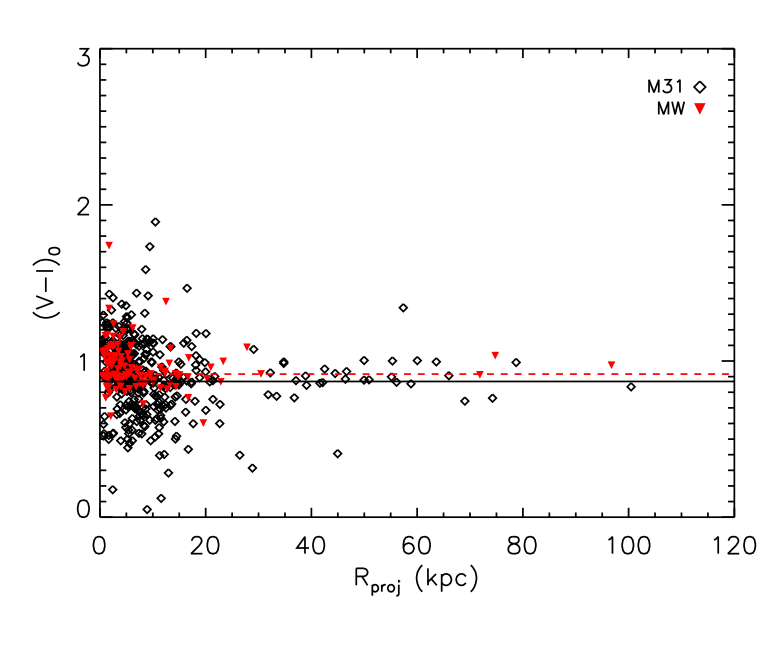 That is to say, 120 kpc is a pretty great distance, especially when we consider that the M31 GCs studied prior to this paper were primarily within 55 kpc. 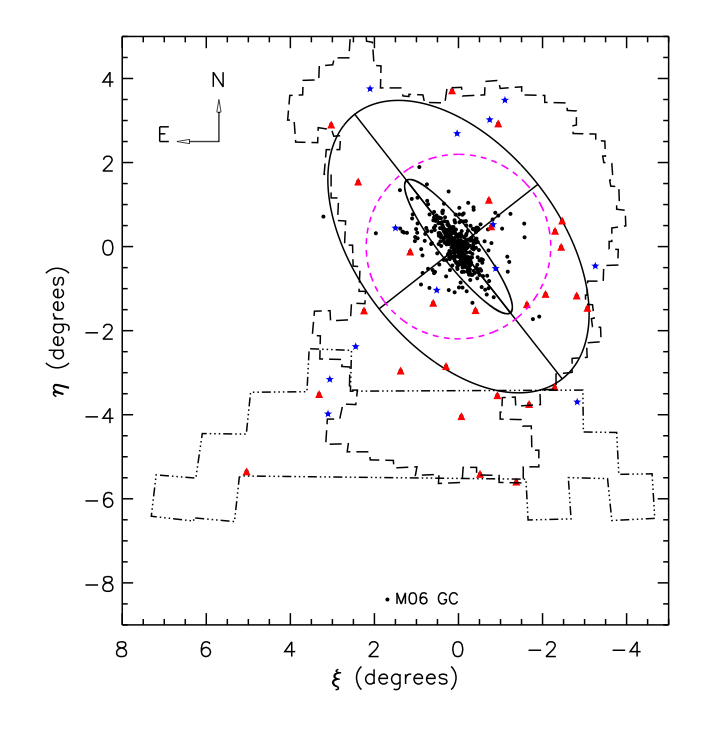 Location of new globular and extended clusters in M31 (red triangles and blue stars) as compared to confirmed Revised Bologna Catalogue GCs (black circles). The updated sample of M31 GCs used by the authors are consistent with the scenario of many GCs being associated with tidal streams in the outer regions of M31 as the authors find no radial color or metallicity gradient at large radii. Such gradients would be expected from accretion. Colour vs. Radius of GCs for M31 (open diamonds) and the Milky Way (inverted triangles). As the dispersion is small beyond 30 kpc, there is no evidence of a radial gradient. 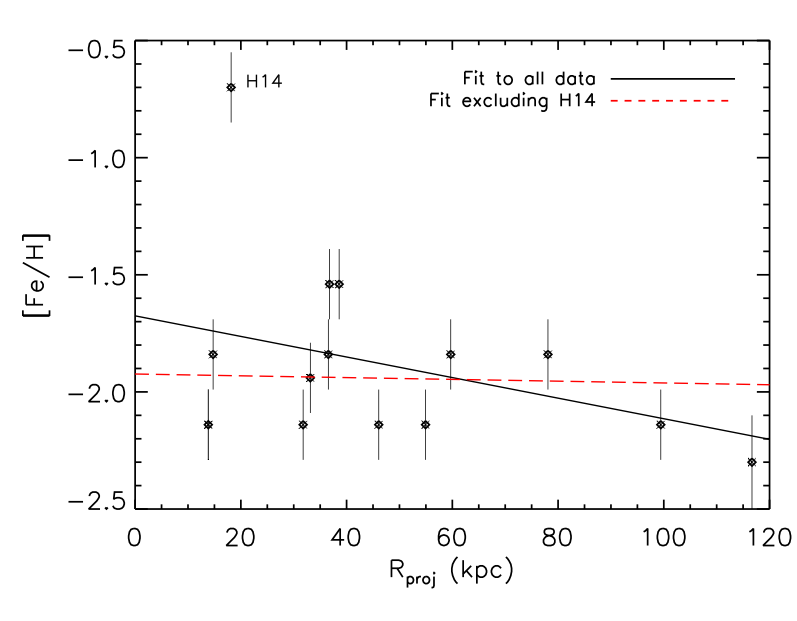 Metallicity vs. Radius of GCs for M31 for 11 compact and 4 extended GCs. Shows no gradient when the one outlier, a possible intermediate-age cluster, is removed. In addition the authors find a flattening in the number density radial profile occurring at 30 kpc. 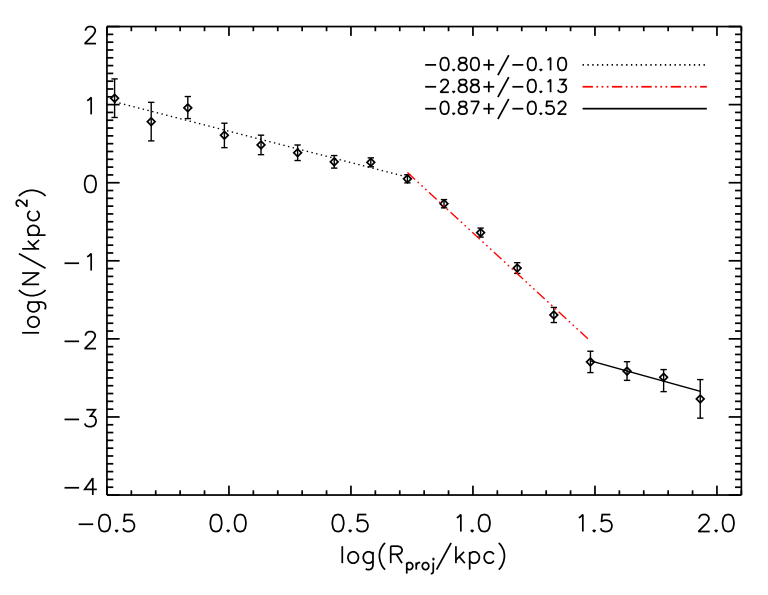 This is interesting as Abadi, Navarro and Stenmetz2 show that this flattening occurs in galaxies that grow through combination of star-formation and accretion and the point of transition (in this case 30 kpc) is the radius after which most of the matter was accreted. This was the first time that this has been seen in M31 and is a result of the extended sample to radii more than three times larger than earlier profiles. The web brings a wanderer to your site, and with what coincidences. I just got a beautiful new 27 inch HD monitor for myself at work because the standard issue monitor is like looking thru a soda straw, and as my new wallpaper I selected a stunning 1900X1280 view of Andromeda. 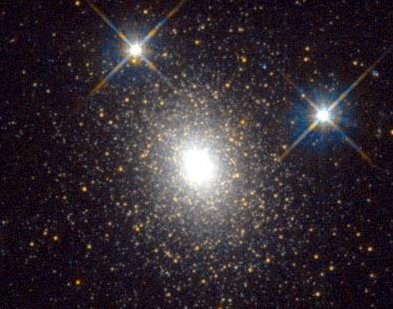 So I’m looking at it over the past week (feeling increasingly insignificant) and marveling at all the beautiful globular clusters that seem to swarm around it. A google search later here I am reading baout your work, which is fascinating. Thank you for sharing it and I wish you well in its pursuit. My own personal opinion is that ultimately black holes will be found in the center of all globular clusters just as they have been found to be a standard-sized component in all galaxies over the past few years. I’ve looked at your other postings and there are a number of coincidences / similarities between us that I note. I’m an MIT grad, too, but alas from a few decades ago. I went into aerospace engineering in Colorado and Huntsville AL and have had some luck flying hardware have I built with my own hands into space, but the times they are a changin’ and that’s all glory past . Currently I am doing liason work coordinating testing on a large US Army recon blimp being built. All of the people around me in Huntsville that made the mistake of buying into the “let’s go back to the moon” program a few years back are withering on the vine. I have alays regretted not going into science rather than engineering. My original interest as a teen was particle physics and I still try to stay pluged into the current research as an educated layman. I am very interested in the breathtaking advances in cosmology and black hole entropy and so appreciate you lead of the “Short Intro to Particle Physics” articles at arXiv, thanks. Like you mention in one of your postings, I have a curiosity about far more things than I will ever be able to dig deeply into. I think it is very cool that you are digging deep in your choosen area and encourage you to continue. I’ll try to drop by occasionally and catch up on your postings. Best wishes to you! Good article, Christine. I’ve used it as a stepping board for a broader post on extragalactic globular clusters over at my gaff. I’d like to ask a question though, but if this isn’t your area of expertise, then feel free to ignore it: what do you think of the claims that Omega Centauri is also an extragalactic cluster/ex-galaxy nucleus? Thanks for stopping by and for the link back. It’s not my area of expertise, but the claims seem plausible in light of the range of metallicities in Omega Centauri and some speculation about a central black hole. Well, the globular clusters confound science (again). They are not disordered (have yet to create black holes, dark matter, etc., perfectly spherical, not spiral. In other words they are a perfect creation without anomalies, aka pre Second Law. I love it. An excellent and exciting discussion about Andromeda’s GC family. G1 in particular is most interesting. Stunning astrophoto. Encourage you to come visit on Twitter @XiNeutrino.